It’s not that hard to work out what, for most construction companies, is the biggest stumbling block to investing in workplace health at the moment. The industry, according to the latest figures from the Chartered Institute of Purchasing and Supply (CIPS), published in November, has been contracting for the past 20 months, having been one of the first sectors to feel the pinch of the recession and one of the most severely hit throughout it. At the same time, many thousands of jobs have gone, with workers both being laid off or, with much of the industry self-employed, struggling to keep their heads above water. Two comments sent in to the Times in response to the CIPS figures summed it up: “My company has just announced plans to lay off thousands of staff because the market is not coming back for them. Sales and profits are down, and it’s the same for competitors too,” said one. “It is a bleak picture and getting worse,” added another. Against this backdrop, occupational health (OH), which is still perceived within the industry as a ‘nice to have’ rather than a ‘must have’, can end up severely squeezed or, at worst, left out of the picture completely. Difficulty in hearing, in hearing other people talking and in working out which direction noises are coming from. Breathing difficulties which could stop you living a normal life outside work. when returning to a warm room after being out in the cold. The wider economy apart, however, on one level it’s arguable things are improving. When it comes to injuries and fatalities in the industry, the trend is going in the right direction. According to the latest statistics in October 2009 from the Health and Safety Executive, in the previous 12 months, health and safety deaths across all industries fell to a record low of 180. Of these, 53 were in the construction industry, making it the third most dangerous industry in the UK, although, again, things were getting better, with fatalities down 26% (from 72) the year before. But, as construction industry union Ucatt has also pointed out, construction death rates were highest in London, the south west and Scotland, while the number of self-employed workers killed actually rose, by 5%, in contrast to the overall decline. “I do not think OH can help that much with deaths in the industry, to be blunt, because that comes down to health and safety,” points out Dominic Hiney, managing director of Chesham-based OH provider Healthcare Connections, which was one of the first to become an accredited provider through Constructing Better Health (CBH), which is working to put an industry-wide OH service in place. “But where it can help is when people are no longer able to work because their hand-arm vibration, say, has become more acute, or when it is about ensuring workers are not inhaling cement dust, and so on,” he adds. Nevertheless, it is telling that of the firm’s 800 or so clients, some 85% are in the rail industry rather than construction. “In the rail industry, everyone is required to jump through the same hoops and abide by the same laws. So every company has exactly the same sort of overheads when it comes to OH. But in construction you do not have these sorts of laws, so the incentive is always to put in the lowest bid to win the contract and then cut costs to the bone, with the result that something like occupational health tends to be one of the things that suffers,” says Hiney. And, although there has been progress, against the backdrop of the recession it is proving to be a steep climb and a slow process, concedes CBH OH director Wendy Stimson. “With safety, it is there, it is immediate and you can see the benefit. It is also something they know, understand and recognise they have to do; they know when they are sending people on site that they have to have safe systems of working,” she explains. “With health, it is much harder for employers to see that there is a duty of care issue that will also be beneficial to them. “It is also a huge and very disparate industry, with something like 2.4 million workers spread across 192,000 employers. And of those, 80% will employ fewer than five people. So for a lot of construction, when it comes to OH, they still really do not get it,” she adds. For the past 18 months, CBH has been developing a national OH database and card scheme, in conjunction with the Construction Skills Certification Scheme (CSCS), which provides workers with a card to prove their competence to do the job. The card is designed to allow site managers and employers to obtain “fitness for task” information on their workers, and was piloted on 1,000 workers at 50 sites last year by supermarket chain Sainsbury’s. CBH also published a White Paper in October, outlining where OH needed to go in the industry, and has been working to develop closer links with organisations such as Jackson Civil Engineering and the Environment Agency, one of the sector’s biggest clients. When it comes to the card, one stumbling block has been last spring’s controversy over allegations that some construction firms had been blacklisting workers over union membership, in the process flouting the law by paying to receive personal and employment history information. While this had nothing to do with CBH or its card, the issue of employee data and history, particularly health history that could potentially be used to decide whether or not to employ someone, suddenly assumed a new sensitivity, as Stimson points out. “We had to satisfy both unions and management about any concerns they might have had that this could be seen in any way as discriminating against employees. So we had to revisit the whole thing, which slowed things down by about two to three months,” she says. As a result, the card now has two different displays: one that a worker’s employer can check for full health surveillance data, and one that can be accessed by a prospective employer, which shows much less data. “If you are not the employer, you will get a box showing who their employer is and that they are managing that individual’s occupational health, as well as access to any safety-critical information,” adds Stimson. Other CBH developments include expanding its Construction Health Action Toolkit into a “far more detailed OH management system” for contractors to use, particularly those at the small to medium-sized end of the market. “It enables principal contractors to sign up their contracted workforce to undertake an OH assessment and eliminate hazards. It is a bigger, better tool than anticipated,” says Stimson. The scheme is also pressing on with accrediting OH providers, with 15 signed up, and a marketing campaign was launched in January, targeting HSE-appointed doctors. “If we are really going to improve health in the industry, we need everyone to work together,” adds Stimson. “Firms may well be working to good standards of competency, but we also need them to join CBH to ensure that health data is captured on the database. Workers too often go from site to site and employer to employer, and their occupational health records do not follow them,” adds Stimson. But, while its approach may be well-meaning, Caroline McLeod, managing director of construction industry medical and health services provider ConstructionCare, is sceptical CBH is on the right track, or even that OH practitioners are the right people to be trying to tackle the very specific health and wellbeing challenges posed by the industry. “We are on a dozen construction sites across the UK and I just do not believe CBH’s card idea will work, though good luck to them with it,” she says. “Occupational health most often works well where you have a stable workforce, working regularly in the same place in a controlled environment. The construction industry is not like that, and conventional occupational health protocols or models do not fit into it easily. “The majority of the men are self-employed and so will not be entitled to sick or holiday pay. They will often be working miles from home; 80% of them do not even have a GP, and many do not even have access to a dentist. They are more likely to take time off work or go to the doctor than fly backwards down the M1,” she adds. Another big issue can be the way projects are structured, with work generally split between a principal contractor and multiple sub-contractors. Especially in such a competitive environment as now, no contractor is going to want to disadvantage themselves by having anything extra on their bill, such as health screening, that might mean they end up losing work, or not winning it in the first place. “The key to it, I believe, is to have a proactive induction – to catch them at that point,” advises McLeod. “Often what happens is they just get sent into a darkened room with a bacon buttie and a cup of tea where they are shown a video and they fall asleep. “So we make sure ConstructionCare nurses are there at every induction and speak to all new workers. We introduce them to the services we offer on site and give them the opportunity to fill in a voluntary health induction questionnaire. “More widely, some of the things we’ve successfully introduced include chiropody on sites, smoking cessation and mobile dentistry, physiotherapy, and even some alternative therapies,” she adds. “If you can show a company they will get improved productivity and lower absence rates – both of which mean they will be more likely to complete projects on time and on budget – they will sit up and take notice. We are even starting to get involved with companies at the smaller level now – for example, we are working with a local engineering firm and a painting and decorating firm,” she adds. “For me, the long-term answer is not OH-trained nurses on site. It is to have specialist construction industry nurses who understand the trade, who are trauma trained or have a background in A&E, recent NHS work or even primary care, as well as the occupational health side. They need to have the confidence to be able to walk on site and say: ‘Do not do that’. “They need to be NEBOSH [The National Examination Board in Occupational Safety and Health] trained and understand health and safety, but also about working in confined spaces, at heights and with hazardous substances. You cannot have a nurse on a construction site that might have 2,000 men on it working in a dangerous environment away from home who does not treat patients. There needs to be a new specialism,” McLeod stresses. 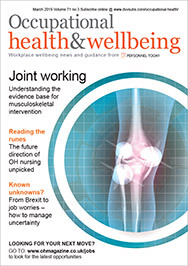 Occupational or workplace health in the industry has to be something being led from the top, from government through legislation, and by the big players and big clients ensuring workplace health provision is something contractors recognise they need to have if they want to land those vital contracts, agrees Healthcare Connections’ Hiney. “Getting accredited shows how seriously we take it, but unfortunately the construction companies still do not take it as seriously as they might. It is a time issue, but it is also a financial issue. If you do not have to have it by law, then they are simply not going to do it. It needs to come from government and also from clients,” he says. “There are so many things that can be monitored through a formal screening scheme, but it has to be driven by the large contractors. If CBH can be a lobbying force within government circles and can help to effect regulatory change, then that will be their biggest contribution. It is about persuading the companies to spend money where they do have to spend money,” he adds.